Union Kitchen & Tap's Cocktail Academy - San Diego Dining Dish! 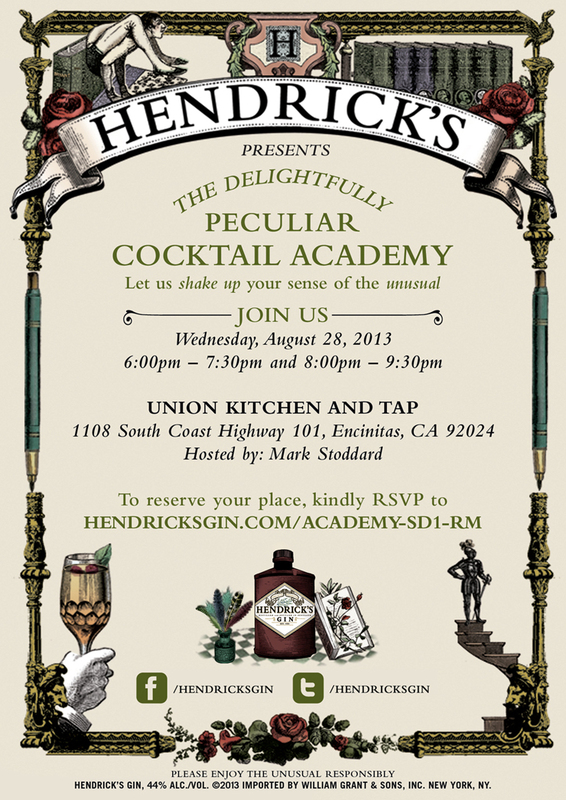 This Wednesday, August 28 head to Encinitas’ Union Kitchen and Tap at 1108 South Coast Highway 101 for “The Delightfully Peculiar Cocktail Academy” hosted by Mark Stoddard from Hendrick’s Gin. Stoddard, Hendrick’s Ambassador of the Curious and Savant and Mixologist, shakes up the senses and demonstrates how to concoct unique cocktails with the Scottish small batch gin. Two seating times are available on Wednesday night, the first from 6:00pm to 7:30pm and the second from 8:00pm to 9:30pm. Heighten your weekday after-work experience and learn from the master about this curious gin infused with rose and cucumber. 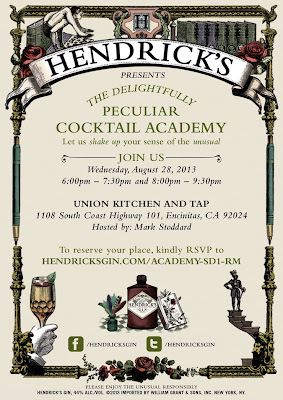 To reserve a place, kindly RSVP to www.HendricksGin.com/Academy-SD1-RM .